Temperature controllers that guarantee high comfort for users of all heating systems. Control and adjustment are basic conditions of operating costs reduction. The standard solution. Their basic advantage is a high temperature measurement accuracy (0,3 – 0,1°C). They operate noiseless. They are equipped with an air sensor, a floor sensor or an air-floor sensor with the floor protection against overheating. They can be surface or sunk installed. Load up to 3600 W. A possibility of co-operation with a control timer allows to save up to 30% of electric energy. They combine advantages of electronic controllers with digital circuit “intelligence”. A possibility to program temperature in 24h and a week cycle. A possibility to read out on a LCD such data as: a room real temperature, previously programmed comfort and economic temperatures, a heating system operating time, a program number and its graphical image. 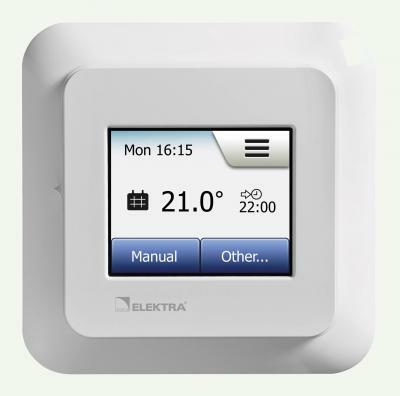 Selected models have an adaptation function: the temperature controller “calculates” itself the heating switching off moment to reach a desired temperature at a programmed time. Load up to 3600 W. They can be surface or sunk installed. Controllers with adjusted hysteresis as well as the ones that cooperate with a humidity detector. Their application is very wide, starting from temperature control in apartment buildings through anti-freezing protection (gutters, pipes, valves, access roads, gates, stairs) up to industrial pipelines protection.